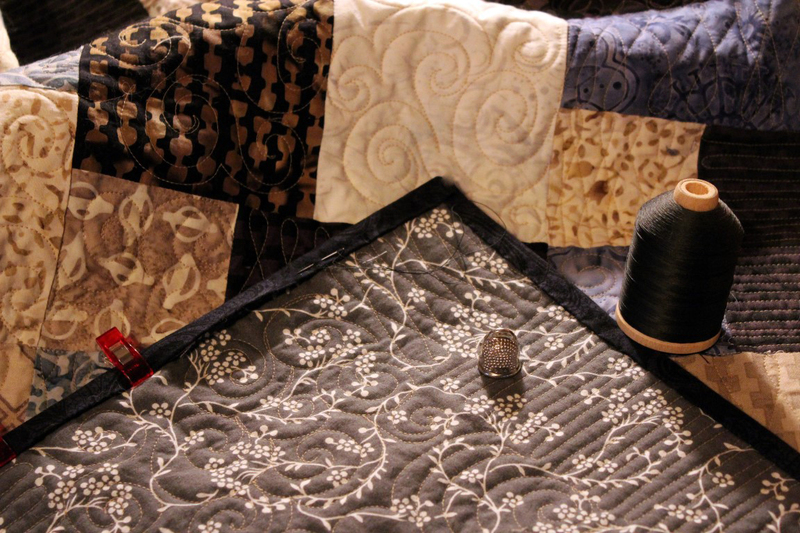 A single color thread is included in the quilting design cost. There are no bobbin charges. I will use the same thread color in the bobbin as well as on top of the quilt. I use Superior - So Fine #50 thread. Additional solid color thread changes are $5.00 each and variegated thread is available for $15.00 each. Binding is available, I will make and attach your binding (2 ½” Straight strip folded for a double binding) with mitered corners using the fabric provided by you at the time of your quilt submission. (I recommend 1 yard of binding fabric) Please let me know your preference of trimming – at the edge or ¼” beyond the edge for batting fullness in the binding. (Trimming is included in the Binding Cost) All extra binding fabric will be returned to you unless instructed otherwise. Scalloped or Jagged Edge quilt bindings available at additional cost. Machine Basting is also available for hand quilters. Your Quilt is basted horizontally and vertically in a 4” grid using long stitches for easy removal. Cost $40.00 for any size quilt top. High quality batting is available for purchase directly from me (please see above).